Ted Naifeh has told a lot of different stories in various genres over the years, but he excels most when he’s exploring coming-of-age narratives for outsiders who are steadfastly true to themselves. Courtney Crumrin and Princess Ugg both focused on young girls who constantly clashed with the world around them, and Naifeh’s new series with artist Warren Wucinich introduces a new angsty adolescent lead in Kriss, the son of a warlord taken from his father as a child and raised by a couple of farmers. Kriss: The Gift Of Wrath will be released as a graphic novel in the fall, but like Megan Rose Gendris’ Spectacle (one of our best comics of 2018), Kriss will be serialized digitally starting on May 1. The A.V. Club has an exclusive preview of the first chapter, introducing Kriss and the legends of the past who appear before him as apparitions throughout the story. The designs for Kriss’ father and his fellow warlords heavily evoke the dramatic outfits and makeup of the heavy metal band Kiss, and this opening sequence emphasizes how the look of those larger-than-life characters contrasts with the drab reality of Kriss’ farm life. Wucinich colored Naifeh’s artwork on Courtney Crumrin and Princess Ugg, developing a strong creative rapport that makes him deeply knowledgeable about the mood and rhythm of Naifeh’s writing and how to heighten both in the visuals. 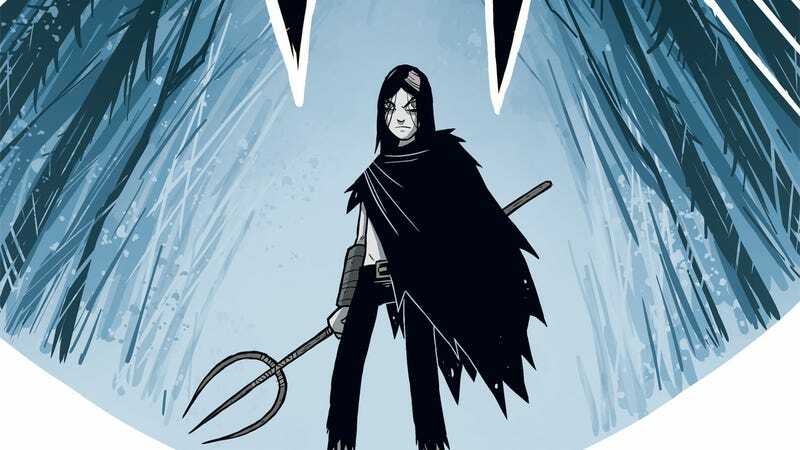 Much of the appeal of Naifeh’s work is how it reinforces dark elements within a kid-friendly aesthetic, and Wucinich achieves that same dynamic as he creates a bleak, frigid atmosphere for this series. Wucinich’s work on Invader Zim has sharpened the movement and expression of his characters, and when the tone shifts at the end of this excerpt, there’s a big rush of energy as Kriss revisits his thrilling past.